Brady Hermann is based in the firm’s Boston office and supports the firm’s litigation matters in its New York office, practicing in the firm’s Commercial Litigation and Consumer Credit Litigation groups. Brady has substantial experience as a litigation attorney. He has represented individual and corporate clients in complex litigation matters, focusing on securities litigation and regulation, business and commercial litigation, multidistrict litigation and class actions and more. 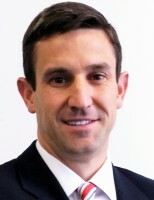 In addition, he has represented many of the nation’s largest securities broker-dealers in arbitration and regulatory proceedings before the Financial Industry Regulatory Authority and has represented and counseled clients in regulatory, enforcement and criminal investigations before the SEC, FINRA, state securities regulators, the Department of Justice, the FBI and various other governmental and self-regulatory organizations. His speaking engagements include: Licensing and State Regulation of Debt Collectors and Debt Buyers, ABA Business Law Section Spring Meeting, April 2018. Brady earned his Juris Doctor from Suffolk University Law School, and his Bachelor of Business Administration from Villanova University. He is admitted to practice law in Massachusetts, New York, the U.S. District Courts for the District of Massachusetts, the Eastern, Western, Northern and Southern Districts of New York, the District of Colorado, and the U.S. Court of Appeals for the First Circuit. He is a member of the national Mortgage Bankers Association, the American Bankers Association, RMA International, the ACA International Members Attorney Program, the American Bar Association, and the Boston Bar Association.